GelRed™ and GelGreen™ are a new generation of fluorescent DNA stains designed to replace the highly toxic ethidium bromide (EtBr). Developed by scientists at Biotium, GelRed™ and GelGreen™ are superior to EtBr and other ethidium bromide alternatives by having a combination of low toxicity, high sensitivity and exceptional stability. Biotium’s DNA stain products are also available for polyarcylamide gels: PAGE GelRed™ and PAGE GelGreen™, non-toxic and non-mutagenic nucleic acid dyes specifically designed to stain DNA in polyacrylamide gels. Download the PAGE Gel Stains flyer for details. Shown by Ames test and other tests to be nonmutagenic and noncytotoxic. Passed environmental safety tests for direct disposal down the drain or in regular trash. Much more sensitive than EtBr and ethidium bromide alternative SYBR® Safe. Stable at room temperature for long-term storage. 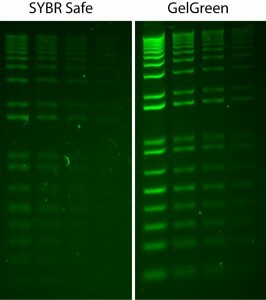 Comparison of ethidium bromide (EtBr) and GelRed in precast gel staining in 1% agarose/TBE gel. Two-fold serial dilutions of 1 kb Plus DNA Ladder (Invitrogen) were loaded in the amounts of 200 ng, 100 ng, 50 ng and 25 ng from left to right. Gels were imaged using 300 nm transilluminator and photographed with an EtBr filter. 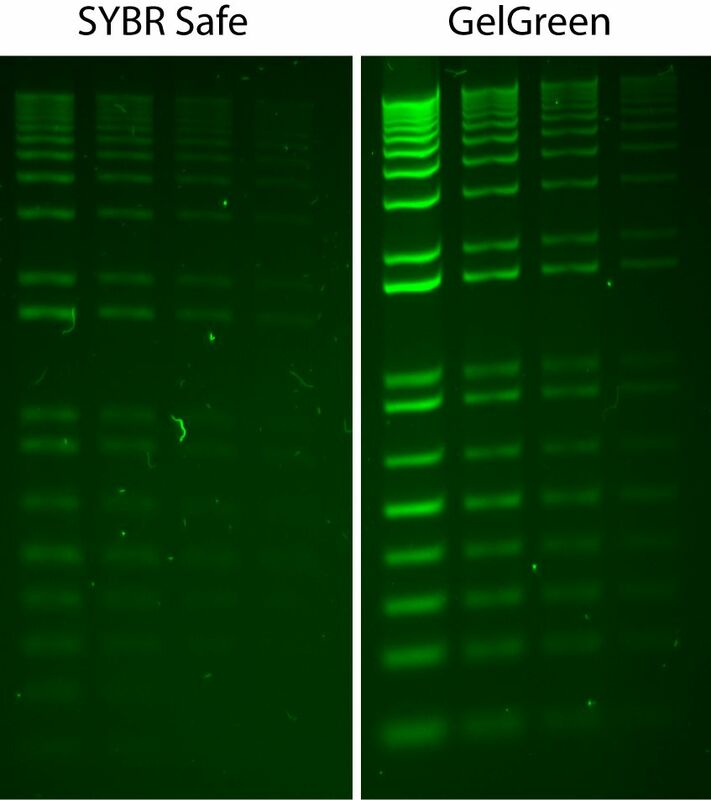 Comparison of GelGreen and SYBR Safe in post-electrophoresis staining of 1% agarose/TBE gels. Two-fold serial dilutions of 1 kb Plus DNA Ladder (Invitrogen) were loaded in the amounts of 200 ng, 100 ng, 50 ng and 25 ng from left to right. Gels were imaged using 254-nm transilluminator and photographed with a SYBR filter. EtBr has been the predominant dye used for nucleic acid staining for decades because of its low price and generally sufficient sensitivity. However, EtBr is a highly mutagenic material. The safety hazard and costs associated with decontamination and waste disposal can ultimately make the nucleic acid dye expensive to use. For this reason, ethidium bromide alternative DNA gel stains, such as SYBR® dyes, have become commercially available in recent years. Although these alternative nucleic acid staining dyes have reduced mutagenicity, they often have to sacrifice other aspects of the dyes. For example, SYBR® Safe has very limited sensitivity while SYBR® Green and SYBR® Gold are much less stable than EtBr. SYBR dyes also enter cells rapidly to stain mitochondria and nuclear DNA, making it more likely for the staining dyes to be toxic at high enough concentrations. Indeed, SYBR® Green I is known to strongly potentiate mutation caused by UV light and another mutagens (Ohta, et al. Mutat. Res. 492, 91(2001)). To make GelRed™ and GelGreen™ safe, scientists at Biotium used a novel yet very simple concept: reduce genotoxicity by preventing the dyes from entering living cells. We believe that a DNA-binding dye can be made nonmutagenic or substantially so by denying its chance to be in contact with genomic DNA in living cells. Thus, we engineered the chemical structures of GelRed™ and GelGreen™ such that the dyes are incapable of crossing cell membranes. 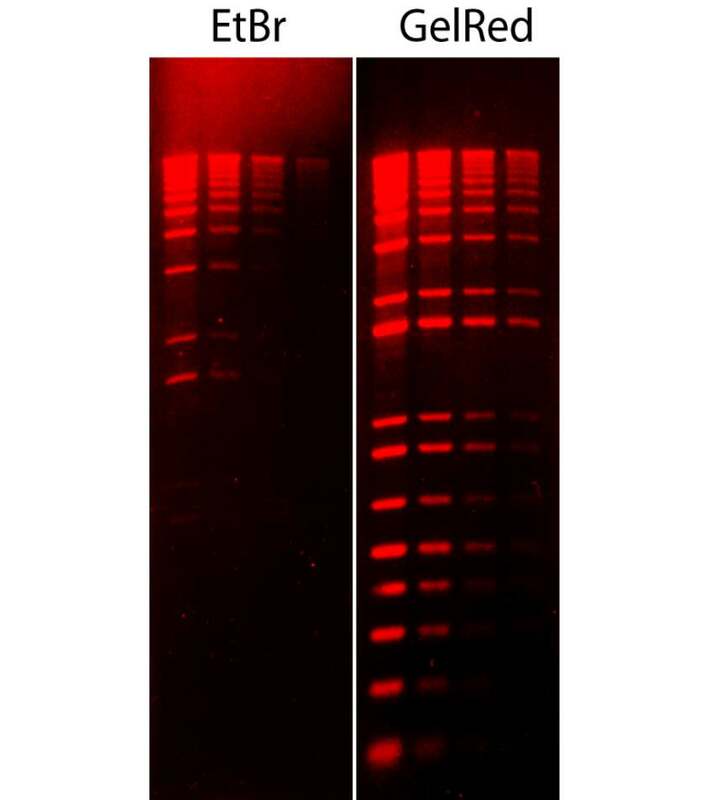 The Ames test confirmed that GelRed™ and GelGreen™ are nonmutagenic at concentrations well above their working concentrations used for gel staining. Furthermore, environmental safety tests showed that GelRed™ and GelGreen™ are nonhazardous and nontoxic to aquatic life. As a result, GelRed™ and GelGreen™ can be disposed of down the drain or thrown away in the regular trash. For more information, please download the GelRed™/GelGreen™ Safety Report. GelRed™ and GelGreen™ are highly sensitive either as precast gel stains or post gel stains. GelRed™ is much more sensitive than EtBr, and at least as sensitive as or brighter than SYBR Gold in post gel staining. Unlike SYBR Gold, GelRed™ can also be used as a highly sensitive precast gel stain. GelGreen™ is spectrally similar to SYBR® Safe, but is far more sensitive than the latter, and can be used with blue light gel imaging systems like the DarkReader®. Another major advantage of GelRed™ and GelGreen™ DNA stain is their remarkable stability. 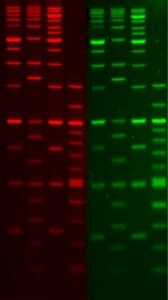 You can store and handle the two nucleic acid staining dyes the same way you do with EtBr. For detailed protocols for use of the DNA stain, please download the GelRed™ Product Information Sheet or GelGreen™ Product Information Sheet. Also see our GelRed™ and GelGreen™ Frequently Asked Questions (FAQs). Normalized excitation and emission spectra of GelGreen (green) and GelRed (red) in the presence of dsDNA in PBS buffer. GelRed and GelGreen DNA gel stains are safer because they cannot penetrate cell membranes to bind DNA in living cells. HeLa cells were incubated for 30 minutes at 37°C with 1X SYBR Safe, GelGreen or GelRed. The top row shows phase contrast images of the field of cells, the bottom row shows green fluorescence for SYBR Safe and GelGreen and red fluorescence for GelRed. SYBR Safe rapidly entered cells and stained nuclei. GelRed and GelGreen were unable to cross cell membranes, demonstrated by the absence of fluorescence staining. Comparison of mutagenicity among GelGreen, GelRed, SYBR Green I and EB in +1 frameshift Salmonella indicator strain TA98 with the presence of S9 fraction. The closed arrow indicates EB was not tested at this concentration. Open arrow indicates SYBR Green I was cytotoxic at this concentration. For more information, please download the GelRed and GelGreen Safety Report. GelGreen™ and GelRed™ and their uses are covered by US and international patents. SYBR is a registered trademark of Invitrogen Corp; DarkReader is a registered trademark of Clare Chemical.